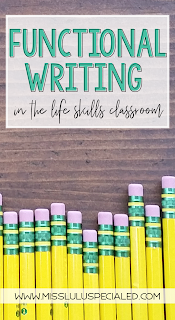 Writing is one of my favorite subjects to teach! Our students need to be able to write to function independently. 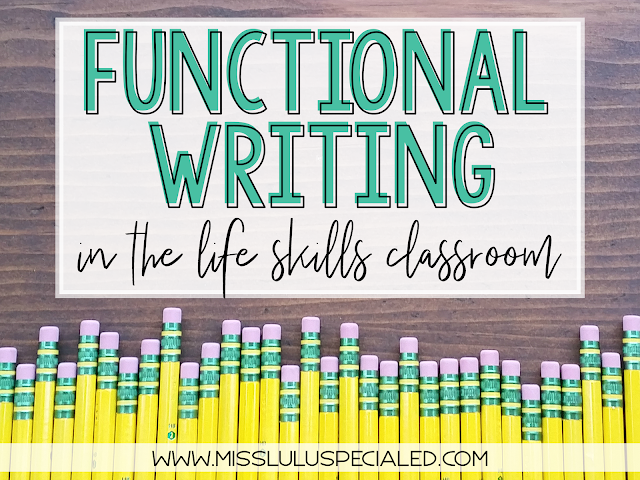 Functional writing is something that we work on throughout the entire school year. Here are some of the skills I work on with my middle school students. 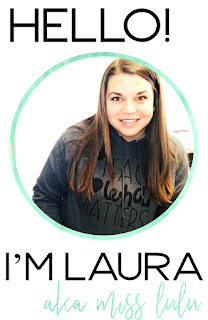 Personal Info: I create a Google Form for each of my students and they practice typing their personal info into it each day. You can add correct answers when you create your Google Form and it will even score it for you. Quick and easy data! I also have these free fillable forms in my store for practicing personal info. Emails and Letters: My students all have a district email address so we practice sending emails to each other. I give my students a writing topic and they practice sending an email to a classmate addressing the topic. They CC me in the email so it's easy to see what mistakes students are making so I can address them in my mini lessons. 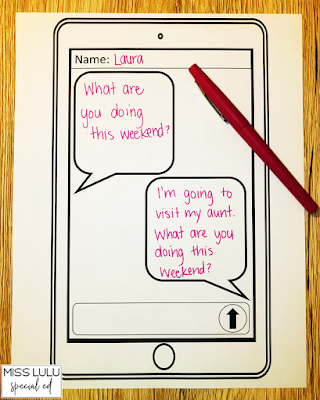 Text Messages: Text messaging is super motivating for my middle schoolers. I use this website to create a text prompt and ask my students to practice responding. You can download a free response sheet here for your students to practice! Lists: I love incorporating list writing into our cooking lessons. Before we cook, I have my students read the recipe and make a list of ingredients that we will need to buy. This is also a great way to practice checking inventory. We also practice writing a to do list when working on tasks and in general education. Signatures: I don't teach handwriting in middle school, so I especially don't worry about teaching cursive, except for signatures. I think it's very important to teach our students how to sign their names. 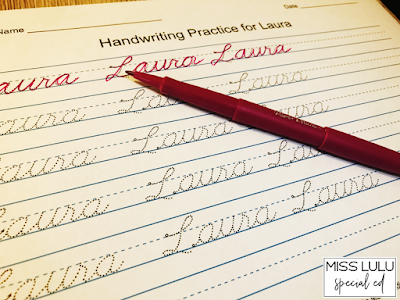 I use this free website to create cursive practice pages. You can type your students name directly into it, print and go. I laminate mine or throw them in a sheet protector and then my students can use their dry erase markers to practice. Cards: Greeting cards are a great way to incorporate functional writing into your curriculum. We make holiday cards, birthday cards and thank you cards. I always start by brainstorming with my students words and phrases that we can use for the occasion before starting. Writing cards is another great way to practice signing our names. 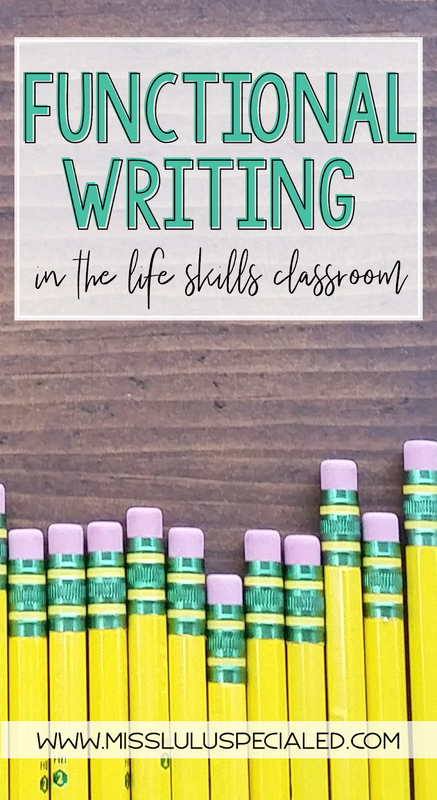 What functional writing skills to you work on in your classroom? Leave a comment below. Get your exclusive FREEBIE when you subscribe to our newsletter. © 2015 Miss Lulu. Felicity Template designed by Georgia Lou Studios All rights reserved.